Home > Products > Digital Ads Everything to promote your business! ​Google Ads is an online advertising tool that helps businesses connect with their customers. When you create an online digital ad, you tell Google Ads who you want to reach, and Google Ads brings your ads to them. That's it. Google is where people search for what to do, where to go, and what to buy. Your ad can appear on Google at the very moment someone is looking for products or services like yours. Whether they’re on a desktop, a smartphone or tablet, a well-timed ad can turn people into valuable customers. Google Ads has a sophisticated targeting system that helps you show your ads to the right people, in the right place, at the right time. Using keywords, location, demographics, and more to target your campaigns ensures you find the right target audience. Google Ads shows you how many people see your ads, what percentage of them click to visit your website, and even how many click to call you. With these tracking tools, you can even see the actual sales your website is generating as a direct result of your ads. Google Ads gives you complete control over your budget. You choose how much you spend per month, per day, and per ad. There’s no minimum and you can set the maximum you are willing to spend each month. If you want to change your online ad strategy mid campaign, you can tweak your ad, try new keywords, or pause your campaign and re-start it whenever you like. Get in front of customers when they’re searching for businesses like yours on Google Search and Google Maps. Only pay for results, like clicks to your website or calls to your business. Call for more information on 1300 85 26 85. ​More than 2 billion people are using Facebook every month. There are 1.6 billion people worldwide connected to a small business on Facebook (source Facebook). This huge, global audience means Facebook is a key marketing platform for just about every business. Regardless of the kind of audience you want to reach, you are highly likely to find them on Facebook. Facebook allows you to get your message in front of the people who are most likely to want your products or services. Micro-targeting features allow you to reach your exact target audience based on demographics, location, interest and behaviour. That helps your budget, conversion rates and return on advertising investment. You only pay to reach the most valuable potential customers. Using Facebook allows you to create one ad and show it everywhere on the internet. You can run ads across Facebook, Instagram, Audience Network and Messenger. By making a single campaign, you can reach people on all of their favourite apps and websites. Simple photo ads can be entertaining and effective at the same time. This may be a photo of your product presented in an interesting way. Video ads can show your team or your product in action, or they can simply be aspirational. A carousel ad uses up to 10 photos or videos to showcase your product. You can use this format to highlight different benefits of one product, a number of different products, or even use all the photos together to create one large panorama image. Slideshow ads offer an easy way to create short video ads from a collection of still photos or existing video clips. They have eye-catching motion just like videos, but use much less bandwidth so they work well on slow internet connections. Collection ads are only offered for mobile devices and allow you to showcase one or more products that customers can click on to buy. Lead ads are only available for mobile devices, for example, smartphones and tablets, as they are designed to make it easy for people to give their contact details without a lot of typing. Dynamic ads allow you to promote targeted products to consumers who are most likely to be interested in them. For example, if someone has visited a product page or placed a product in their shopping cart on your website, but then abandoned the purchase, dynamic ads for that exact product will appear in their Facebook feed. This reminds the customer to complete the purchase. Photo ads, video ads, carousel ads, and dynamic ads can all be set to appear in Facebook Messenger. This additional ad placement gives you access to 1.3 billion people who use Messenger every month (source Facebook). To advertise your business on Facebook you will need a business Facebook page. You can set this up yourself for free, or we can do it for you for a small fee. Visit the Non Stop Adz Facebook page. There are more than 1 billion active Instagram accounts worldwide every single month (source Facebook). There are 500 million+ Instagram accounts worldwide that are active every day (source Facebook). 80 per cent of accounts follow a business on Instagram (source Facebook). People come to Instagram to be inspired and to discover things they care about. Businesses can tap into people’s passions to create deeper relationships with their business. Instagram allows you to tell your story using unique creative tools and immersive formats that inspire action. The opportunity exists to connect with new customers and strengthen relationships with existing customers. Instagram is owned by Facebook so the digital advertising opportunities offered by Facebook are also available to businesses on Instagram. ​Visit the Non Stop Adz Instagram page. 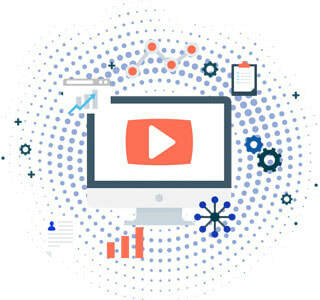 YouTube allows your business to be seen where everyone is watching. You can reach potential customers and have them take action when they watch or search for videos on YouTube. You only pay for your ad when they show interest or take action. It’s easy to become overwhelmed with the size of the advertising opportunity on YouTube. The fact is you don’t need to get your ad in front of everybody. You only need to reach the people who matter to you and who are likely to be interested in what you have to offer. The good news for businesses is that you only pay when someone chooses to watch at least 30 seconds of your video ad or clicks on your TrueView ad.